Tax questions aren’t one size fits all, and your clients have a lot of them. That’s why we offer a full range of resources to give you the answers. From quick tax rate look ups to the rate of depreciation of your client’s Winnebago, Quickfinder has you covered. No matter the tax question, we’ve heard it all before. If it’s out there, it’s in here. Access your trusted Quickfinder content wherever you are working during the busy tax season: home, office, with your client, or elsewhere on the go. With Quickfinder eBooks on Thomson Reuters ProView, you can perform lightning-fast searches, print and email pages with ease, add notes and bookmarks and highlight text — which automatically syncs to your other devices. 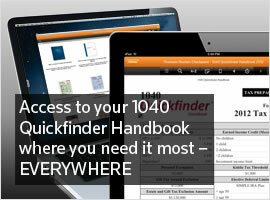 On your iPad or PC, online or offline, Quickfinder eBooks work everywhere you do. Watch the video to learn more. Whether you’re always on the hunt for the best offer or just appreciate a good deal, we all like to save a little dough. So we’ve made it easy to find quick answers to your clients’ tax questions at an affordable price. With our new quantity discount pricing, you can save up to 25% on Quickfinder*. Choose the Quickfinder products you want in the quantities and formats you need to build your perfect tax quick reference library.